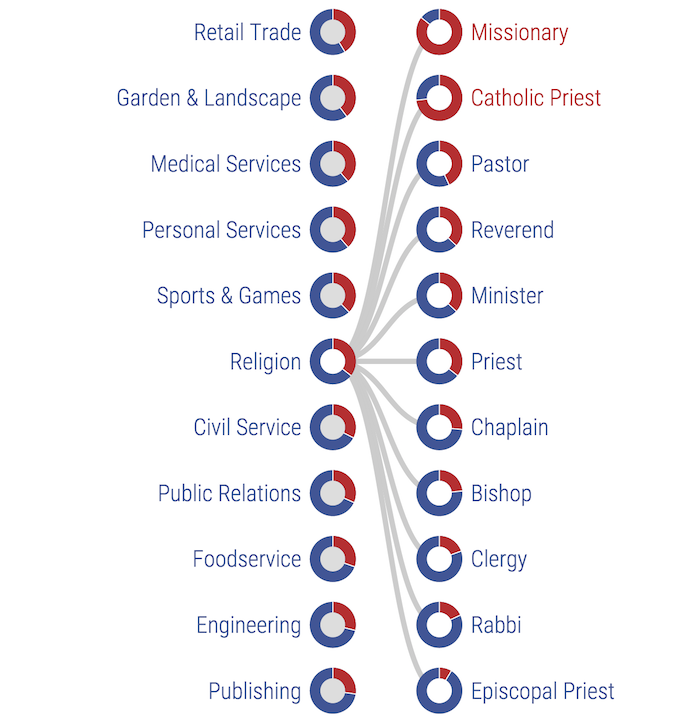 Are Catholic Priests Mainly Republicans and Protestant Pastors Mostly Democrats? Farmers tend to be conservative—at least until they retire, when the skew liberal. Those who serve in the Marines and Air Force tend to be Republicans while soldiers and sailors lean toward the Democrats. Golfers are the most conservative sports players while poker players at the most liberal. Those are some of the intriguing findings from a series of interactive charts by Verdant Labs that show the average political affiliations of various professions. To determine the political leanings, Verdant used the data from the Federal Election Commission on contributions to political parties as a proxy for political views. While I’m skeptical that the charts show a true representation of the political leanings of a particular field (though they are probably close), they do provide an interesting perspective on who gives money to politicians. Take, for example the chart on religion. The blue is the percentage that gives to Democrats and the red is for those who give to Republicans. Are Catholic priests overwhelmingly Republican? Probably not. What is more likely is that the percentage of priests who donate to political candidates skews to the conservative side. That is also what I suspect is true about the presumably Protestants) pastors: those who give to candidates are those who are most likely to be Democrats. Nevertheless, the interactive charts are worth checking out. How does your profession lean, left or right?